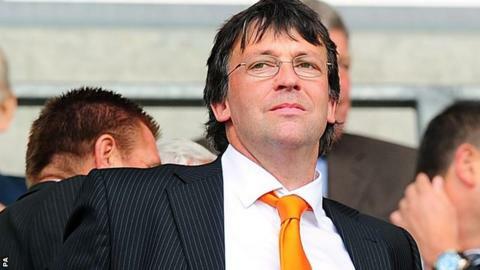 Karl Oyston should resign as chairman of Blackpool after sending abusive texts to a fan says club president and shareholder Valeri Belokon. The Latvian, 54, is also urging Blackpool fans to write an open letter to Oyston condemning his behaviour. Oyston has since apologised for the texts but the Football Association has yet to act on the matter. Belokon told BBC Radio 5 live Sport that he intended to write to Oyston telling him "that maybe he should go". In an interview that can be heard in full on 5 live Sport on Tuesday night, Belokon added: "I would like to invite Blackpool fans to write and sign an open letter for exclusion of such an attitude towards football fans." Oyston, a member of the Football League's board of directors, is alleged to have called Blackpool fan Stephen Smith "a retard" and told the individual to "enjoy the rest of your special needs day out". He is "in shock" at the nature of the messages, which are "unacceptable" and embarrassing for the club. Oyston's apology for sending the texts "is not from the heart" and indicates the views are indicative of his character. The Football Association should review Oyston's suitability to be chairman of a football club. He would be interested in buying the club from the Oyston family in the future and has the funds to do so. He is keen to invest in the playing squad in January but "does not want money to go to the Oyston family". This is not the first time that Belokon has been critical of Oyston, having been questioned the lack of investment in the playing squad during the summer. The Seasiders are bottom of the Championship after 22 matches - 10 points adrift of safety - and have won twice in the league this season. The BBC contacted Blackpool on Tuesday afternoon seeking a response from Oyston to Belokon's comments and is awaiting a reply.